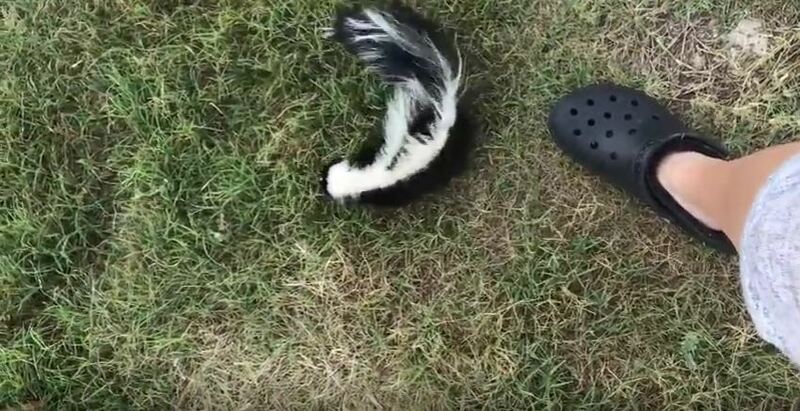 ﻿ What should I do with a skunk after I catch it? Skunks are nocturnal in nature and so if you are to try trapping them, you need to set the trap before sunset and then reset when morning breaks. The skunks will rarely be out during the day. It is important that you use the right technique to make sure that your attempts at catching the animal are totally successful. It is important to handle all the wild animal problems as fast as possible to protect your children and pets from possible attacks and diseases. When you discover that you have actually been able to trap a skunk, you may be unsure of what to do next. It is not humane to leave the animal in the cage until it expires. If it is left unattended and trapped, the skunk will panic and it will be frustrated. It may also feel hungry and dehydrated. If you are not sure how to deal with a skunk that you caught, it is very important that you get it under a shed, offer it some food and water, and then get help as soon as possible. The thing with a skunk is the fact that you need to be careful or you will get sprayed. After it is trapped, you need to find a large cloth which is able to completely cover the trap. This is a great way of ensuring that you don’t get sprayed. If you have to relocate it using a vehicle, do so using a pickup, placing the skunk at the back of the truck. You will need to keep the blanket or cloth in place. It is also important to have protective gloves when you are doing this. Relocation is the only real solution when you have caught a skunk. Check with the local authorities so as to determine the legality of the whole process. When you get to the location where you want to relocate, place the cage down and then find an object or a brick which is wide and tall enough to make sure that the door can remain open about 5 inches. Make sure that the object that you choose will not block the escape of the skunk. With the object in hand, you need to approach the trap from the side that has the cloth so that the skunk won’t see you. Drape the cloth so as to cover the cage completely and then get the object. When ready, peek into the trap to ensure that the animal is at the other end of the trap. Open the door quickly and prop it open. Then take the blanket with you as you walk away. The skunk will walk away when it is ready. Go back to the How to Get Rid of Skunks page or email us if you have any other questions about What should I do with a skunk after I catch it?